A safe harbor 401(k) is a type of 401(k) retirement plan that allows small business owners to skirt a specific Internal Revenue Service test. Before you try to understand what a safe harbor 401(k) is, you should know why someone would want one. Most 401(k) plans face an annual nondiscrimination test. The IRS checks to see if a highly compensated employee or business owner is maxing out 401(k) contributions for the year, while the rest of the employees lag in their savings. The IRS wants to see that all employees are taking advantage of the retirement plan, not just those with the high paying jobs. So it tests the plan to find out if the average contributions of highly compensated employees (those who earned at least $125,000 in 2019 or own more than a 5 percent stake in the business) do not exceed the average contributions of everyone else by more than 2 percent. If you're a business owner and your 401(k) has low adoption rates or saving rates among rank-and-file employees, it may raise a flag for the IRS. According to Plan Sponsor Council of America (a lobbying business for the retirement planning industry), most businesses pass the test, but around 40 percent claim to have reported refunding or restricting plan contributions to do so. That's right, refunding contributions! The IRS can actually reject a retirement plan contribution that it feels is excessive. Then you or your employee will owe federal and state income tax on the money. There could also be a 10 percent penalty fee. If the plan can't be fixed through refunded contributions, there's a risk that your entire 401(k) savings will be refunded. It would be your retirement plan's worst day, and could really discourage or stymie the savings of small business owners and their employees. 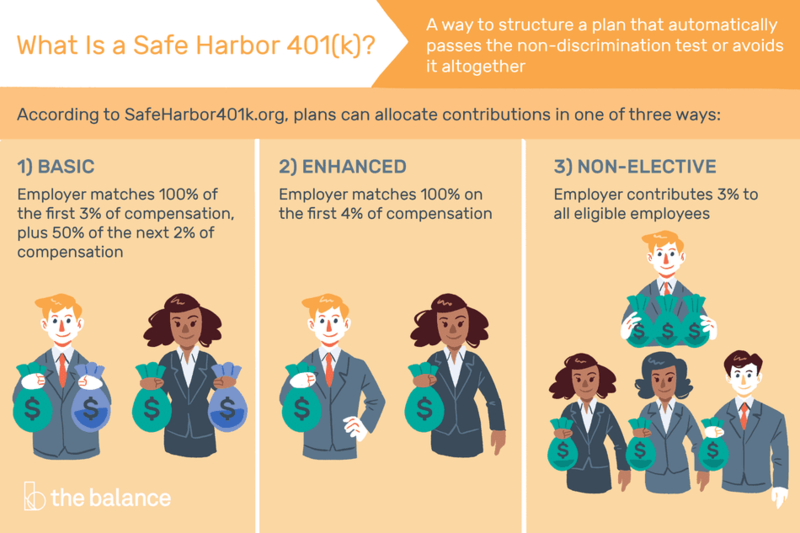 A safe harbor 401(k) is a way to structure a plan that automatically passes the nondiscrimination test or avoids it altogether. It's relatively easy to do, but the employer must make contributions to each employee's plan -- the same percentage of salary for everyone. For example, for every contribution made by an employee, the company adds another 5% of their salary. The amount you match will depend on your own contributions as a business owner. A long vesting schedule is not allowed with safe harbor plans, contributions are fully vested when made. This means you have to give all employees their share -- even those who leave or are fired during the year. You can design your plan to limit matching contributions to only those employees that defer compensation or make contributions for everyone, including those employees who do not contribute to their own plans. Basic: Employer matches 100 percent of the first 3 percent of compensation, plus 50 percent of the next 2 percent of compensation. Enhanced: Employer matches 100 percent on the first 4 percent of compensation. Non-Elective: Employer contributes 3 percent of compensation to all eligible employees. It may be a small price to pay for insurance that your own plan will pass muster. If your plan already includes matching 401(k) contributions, you may already be safe. A safe harbor provision can be attached to any type of retirement plan or 401(k). But it requires a lot of written notification and education for plan participants. And they must receive these documents within 30 to 90 days of beginning employment. Once you get a plan set up, it should be easy enough to execute. Getting a plan set up is the difficult part. It is not a do-it-yourself project. Even if your tax attorney, financial planner or accountant want to set up a plan for you, it makes sense to at least talk to a professional plan administrator and decide whether having a specialist makes more sense. There are even alternatives to a safe harbor 401(k). A business can structure a plan to be age-based so that the investors closest to retirement can receive more in employer contributions. There is also something called a new comparability plan, that breaks the employees up according to classes or tiers, with older or key employees being given a larger profit share. Find someone who understands the various options, can explain them to you and then finds a way to maximize contribution limits for you and other key employees. Safe Harbor 401(k) plans tend to be more suitable for companies with predictable revenue streams. If your business may have difficulty finding matching funds on a consistent basis then other 401(k) plans may be a better alternative to the Safe Harbor 401(k). To find a 401(k) or customized retirement plan for your small business, the 401k Help Center offers a list of retirement plan providers. You can also ask fellow business owners or financial professionals in your area for local favorites. Plan factories are not necessarily better than knowledgeable experts who live in your area. When looking for safe harbor, it pays to shop around.